At its peak, the Chiquita [banana] song was played more than 350 times a day on American radio stations. The lyrics have been rewritten several times, and the changes reflect Americans' improved understanding of bananas. Next year, it'll be XgamesX. 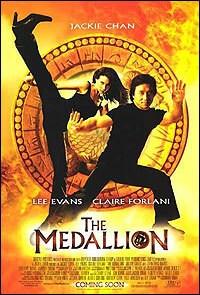 Trading Jennifer Love Hewitt for Claire Forlani and an old Jackie Chan for an even older Jackie Chan, The Tuxedo magically transforms into The Medallion. 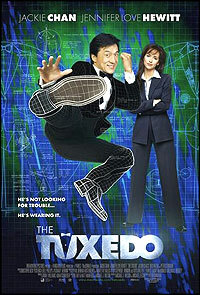 Instead of a futuristic tuxedo that gives him special powers, what about…..an ancient medallion? Pepsi has always been like Coke's little sibling, the Jan to Coke's Marcia. It always wants to do what Coke does. When Coke introduced Tab Clear, Pepsi introduced Crystal Pepsi. When Coke introduced Diet Coke with Lemon, Pepsi introduced Pepsi Twist. Now Pepsi introduces Pepsi Vanilla, its answer to Vanilla Coke. The verdict? Not enough vanilla. I know its slogan is "the not-so-vanilla vanilla," but Pepsi Vanilla tastes too much like regular Pepsi. I felt like I was drinking the Pepsi backwash of a friend who just took a swig to wash down some vanilla ice cream. At least in Vanilla Coke, the vanilla is easily discernible. Pepsi Vanilla reminds me of Dr. Pepper Red Fusion, which purports to be an exciting new flavor of Dr. Pepper despite tasting more like regular Dr. Pepper.